Republicans and some Democrats claim that we have to radically change Medicare because we can't afford it. They're wrong on both counts. Medicare needs a structural overhaul in order to avoid bankrupting the federal government--or so Republicans and many Democrats would have you believe. The latest evidence of this consensus is the Paul Ryan-Ron Wyden proposal to change Medicare into a voucher system where traditional Medicare is one of the options, but there are artificial caps on the value of the vouchers. There's only one problem with this consensus. It's wrong. The push for Medicare reform comes from understandable concerns about health care. Rising medical costs are a serious problem. We spend more than people in other countries, we get less, our gains in life expectancy are mediocre, employers are struggling with increasing health care costs, and of course, 50 million people are uninsured. Third, policies that actually reduce the overall, economy-wide price level for health care--for example, by shifting toward payment methods that focus on outcomes and promote accountability--are good. We should do all of that that we can. When people say we have to drastically overhaul Medicare, they generally don't provide the numbers to back up that claim. That's because they can't. Let's take a look. First of all we have to know how much money Medicare loses today. It's important to realize that Medicare was never designed to be self-funding. Part A (hospital insurance) was supposed to be self-funding through payroll taxes, but Parts B and C were always meant to draw on general government revenues in addition to beneficiary premiums. In 2010, Part A's deficit was $48 billion, or 0.3% of GDP. 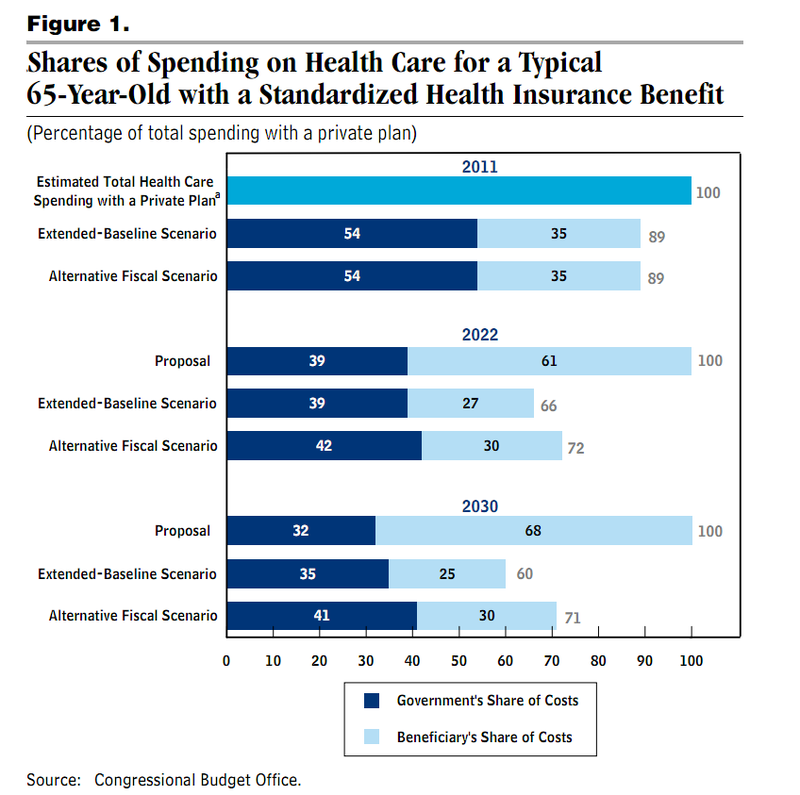 (That's from the 2011 Medicare Trustees' Report, Table III.B4.) Parts B and C together ran a deficit of $205 billion (funding from general revenue, which by construction fills the gap between expenses and other income, in Table III.C1), or 1.4% of GDP, for a total deficit of 1.7% of GDP. In other words, over the next three decades, Medicare's additional contribution to annual deficits will only be 1.3% of GDP. That's not peanuts, but there are plenty of ways to pay for it. For one thing, we could eliminate the tax exclusion for employer health plans, which currently costs the Treasury Department 1.9% of GDP (see "Tax Expenditures Spreadsheet"), including lost income taxes and lost payroll taxes. Forty percent of the value of this exclusion currently goes to households in the top income quintile. If we eliminate the tax exclusion and use half of the proceeds to fund rebates to low-income households, we save 0.9% of GDP right there. Increase the Medicare payroll tax by 1 percentage point (from a level that hasn't changed since 1986, despite twenty-five years of rising health care costs) and you get another 0.5% of GDP. In other words, those two policy changes alone -- one of which eliminates a distorting subsidy that largely goes to the well-off -- could buy us 30 years of Medicare. You may say that this is only sticking fingers in the dike, since health care costs will continue to grow. But this ignores another important fact: Revenues are growing, too, not only in real terms but as a share of the economy. A major reason for this is what's called "real bracket creep." Even though the tax brackets are indexed, they are only indexed to inflation. Over time, as real incomes rise, more and more income slides into the higher tax brackets. Most people think that people who make more money can and should pay higher taxes; by that logic, it's perfectly fair that people pay higher taxes as they make more money over time. In summary, if you look closely, the deterioration of Medicare's finances (1.3 percentage points over three decades) is not as big as most people would have you believe. And if someone tells you about rising long-term health care spending under current law, he should also tell you that tax revenues are rising in the long term under current law. The people who say Medicare has to be radically transformed, though, just don't know the numbers. Or they do, but they ignore them either because they hate social insurance or because they want to raid Medicare spending to fund tax cuts for the rich. You may think traditional Medicare is a bad program. It does have its problems. Most notably, it's based on the fee-for-service model that produces high costs and poor care. But if you want to get rid of it, you should argue that it's a flawed program instead of hiding behind the myth that we can't afford it. * Table III.C4 says that government funding in 2040 will be 22.1% of total individual and corporate income taxes, assuming that those taxes remain at their fifty-year average level as a share of the economy; the fifty-year average for those two taxes is 10.5% of GDP (Table 2.3). ** Growth in Medicare payroll tax revenues is included in those numbers--but growth in Medicare premiums paid by beneficiaries is not included, which also helps the situation slightly. I used the health care costs from the supposedly more realistic "alternative fiscal scenario" but the tax revenues from the "extended-baseline scenario." The CBO's alternative fiscal scenario assumes that tax revenues are magically kept constant at 18.4% of GDP; I think it's excessively pessimistic to assume that current law regarding spending is not changed but current law regarding taxes is changed.